What's Really On The Ballot Today? 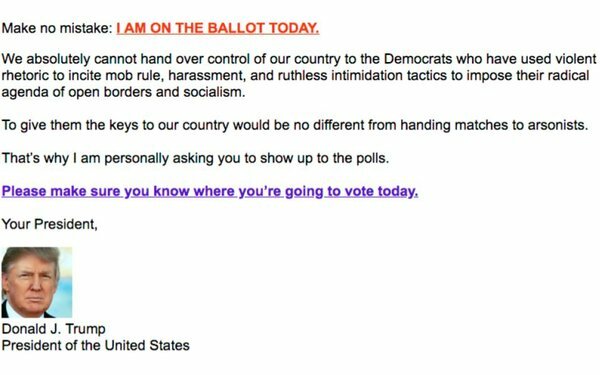 “The character of the country is on the ballot,” President Barack Obama said in his final 2018 campaign speech Monday in Fairfax, VA.
“Make no mistake: I am on the ballot today,” the current POTUS wrote in an email I received in my inbox this morning. Both statements are correct. Today’s elections are more than just Congressional, Gubernatorial and local races. They are also a vote for or against the current President’s unilateral control of two-plus branches of government, or providing a check against that. Sounds more like the current POTUS’ message, especially his “Stop The Caravan” spot, which proved so inflammatory that its was even rejected by Fox News Channel, after initially airing on the network. It was also rejected by the other major broadcast and cable networks, as well as YouTube. Now that I think about it, Obama may have meant something different by the "character of the country" being on the ballot today. Maybe he was referring to a reality TV show character.